If all sections of this acoustical construction fence were linked together in a line, it would span nearly two and a half football fields and be as tall as a two to three story commercial building in some sections. Why is this much fencing needed? This three year, $55 million improvement project entails reconfiguring a 5.2-acre northern portion of the existing 26-acre school campus. The school is located in a densely populated area of posh Santa Monica near businesses and residential dwellings. 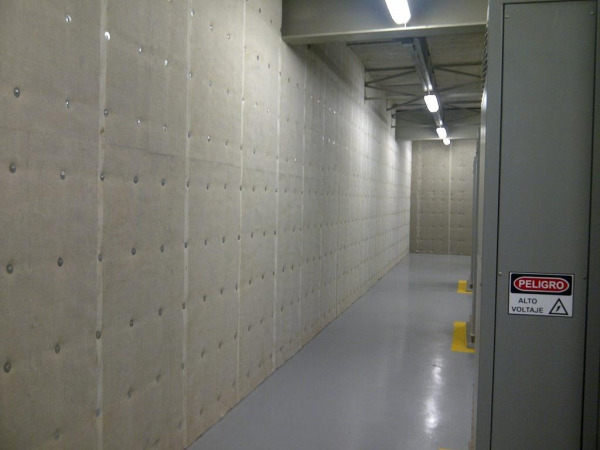 Acoustifence is a modern day acoustical soundproofing product developed by Tampa, Fla.-based Acoustiblok, Inc. It’s an advanced material sound barrier that is placed between a noise source and the noise receiver. The Acoustifence material easily attaches to chain link fences and comes in large sections and in custom made sizes, making it ideal for construction fence applications that require a soundproofing element at the construction site. Acoustifence material is extremely strong and was engineered to withstand harsh outdoor environments like construction sites and highway environments. 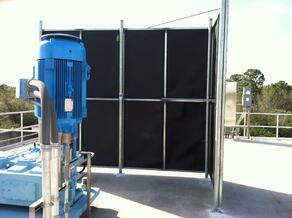 Full exposure to dirt, grease, oil, mold or even being driven over is not a problem for the Acoustifence. The word “green” refers to environmentally-preferable attributes of a product, service, and/or technology. The 1/8” thick Acoustifence is a unique proprietary formula. It is a heavy mineral filled viscoelastic polymer material that is made in the United States from all USA made material. Acoustifence is 100 percent made in the United States. It does not contain lead, asbestos, or barium and is UV-resistant and impervious to water and mold. Graffiti, a real consideration in a school area, is easily removed compared to other surfaces. Acoustifence has had proven success in many demanding applications and is an effective defense against outdoor noise pollution. A construction project this large isn’t simple or easy. It’s messy, noisy and can disturb the usual flow for people around the construction site. The school district was committed to minimizing disruption to students, staff and nearby neighbors during the construction. Mitigating construction noise and dust going into the school and neighborhoods located directly across the street had to be addressed by project planners. The main high school building is located within very close proximity of the construction area. Single family homes, apartment complexes and businesses are located in areas across the street from the campus. “This 5.2-acre construction site is very spread out. Controlling noise from heavy machines, demolition, and construction activities can be challenging at large construction sites located in densely populated areas,” said Glenn Nadalet, Senior Construction Manager for Parsons/CCM. Two sides of the Acoustifence barrier are being used to protect the neighborhood and the other portion protects the school. Temporary chain link construction fencing is commonly used at construction sites to help prevent theft and damage to machinery, equipment, and property, as well as provide security for the construction crew. Construction noise may negatively impact those around a construction site. 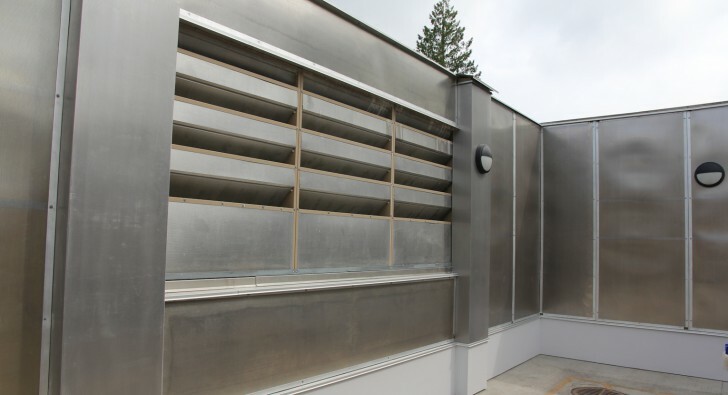 The SAMOHI construction project Acoustifence ranges in height from 14-20 feet at different parts of the construction site and zigzags around the perimeter near the street and the existing school building. In addition to the construction fence, Acoustifence soundproofing material was draped over the side of the top portion of the school building to help make the second floor quieter for students during construction. “Our heavy equipment machines emit between 90-100 decibels of noise while operating depending on the machine itself. Throughout the day, these machines are sometimes located 250-300 feet away from the school building making it virtually impossible to contain all the noise,” Nadalet said. Heavy equipment machines are needed to build large buildings and rebuild a large area like at Santa Monica High School. According to the U.S. Environmental Protection Agency, noise from various construction machines can range from 70-95 decibels at 50 feet. One front loader can reach approximately 83 decibels; scrapers, graders and backhoes approximately 92 decibels; concrete mixers and cranes approximately 88 decibels, earth moving tractors can reach approximately 95 decibels. A single jackhammer can reach nearly 100 decibels and a pile driver reaches approximately 105 decibels. So a 10-decibel decrease in construction noise significantly helps to keep it within a more tolerable range. “The Acoustifence noise barrier wall is located about 10 feet from the school building so our machines are not always located within close proximity to the noise barrier fence. We work hard to keep construction noise as minimal as possible while moving the project forward to meet our deadlines,” Nadalet said. Noise intensity is measured in decibel units. The decibel scale is logarithmic; each 10-decibel increase represents a tenfold increase in noise intensity. Human perception of loudness also conforms to a logarithmic scale; a 10-decibel increase is perceived as roughly a doubling of loudness and a 10-decibel decrease is perceived as half as loud. A typical conversation occurs at 60 decibels – not loud enough to cause damage. If a sound reaches 85 decibels or stronger, it can cause permanent damage to a person’s hearing with prolonged exposure. The amount of time a person listens to a sound affects how much damage it will cause. “The Acoustifence is psychologically positive for the students, teachers and administrators at the school. It gives them confidence that we are taking care of their noise concerns. We believe we get about a 10 decibel decrease in construction-related noise for the neighbors and school with the Acoustifence barrier,” Nadalet said. Acoustiblok now also produces beautiful landscape covers for its fences. Since the covers are an actual photograph of different scenery, such as foliage, flowers, brick, or stones, it is virtually indistinguishable and many say better than real life. Marilyn Myers is Acoustiblok’s Chief Operating Officer who worked on the Santa Monica Fence project. “All our noise barrier products are affected by where they are positioned in reference to the noise source, the distance between the noise source and the noise receiver, the height of the barrier, and the type of environment they are in. The amount of noise Acoustifence reduces is also much related to other reflective structures in the area,” she said. The Public Works Division of FenceCorp, a leading California fencing company based in Riverside, Calif., won the bid to install the large temporary acoustic fence for the project. Acoustiblok’s Acoustifence material was considered to be the best choice for its proven performance and ease of installation. Ira Schechtel, Manager of FenceCorp’s Temporary Rental Fence Division at the Oceanside, Calif. Branch, helped oversee the work. He was heavily involved in the bidding and administrative aspects of the project. Schechtel is an experienced fence professional with 30 years experience in the fence industry. He is also the former president of the California Chapter of the American Fence Association. A fence of this magnitude would be a significant financial loss if it failed to adequately reduce noise. To ensure results, Acoustiblok Corporation’s engineering department uses acoustical outdoor modeling software to accurately predict the acoustical results in advance. The software, called Cadna A, was developed in Germany to create cities with reduced noise levels and is considered the most advanced of its kind. “As we do more Acoustifence projects, we are learning what to look for in advance. Each Acoustifence project has its own unique set of environmental, noise and design challenges with our customers. This is not a one size fits all fencing application. There’s more science to them and to be effective, they have to be positioned in the right places around the noise sources. This just adds to our capabilities,” Schechtel added. Acoustifence is an effective soundproofing solution because it’s a thin outdoor noise blocking material which acoustically performs precisely as lead does, but without the environmental hazard of lead said Myers. 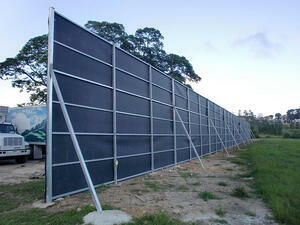 Acoustifence comes in 6 X 30 foot sections considered the most effective first step in reducing noise. It’s now being widely used in construction and building environments, at industrial facilities to quiet generator and motor noises, for mass transit rail lines, residential, and in many other outdoor applications where noise has been an unresolved problem she said. Lahnie Johnson is President and founder of Acoustiblok, Inc. He drives new product development at Acoustiblok. “Acoustical soundproofing materials and products like Acoustifence, Acoustiblok material, Quietfiber, and our indoor and outdoor All Weather Sound Panels compete in specialized niche markets,” he said. For more information about Acoustifence or other Acoustiblok products visit the Acoustiblok website at www.acoustiblok.com, send an Email to sales@acoustiblok.com, or call 813-980-1400. Acoustiblok Corporation, a NASA Spin-off listed company headquartered in Tampa, FL, provides acoustical soundproofing solutions for noise related issues. The company develops, manufactures, and markets acoustical products, earning the industry’s highest ratings from architects, builders, and consumers. Acoustiblok ships soundproofing products to 60 countries around the world. 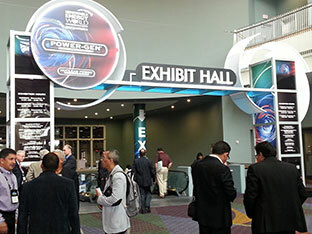 ORLANDO, FL, December 13, 2012 - Acoustiblok exhibited the company’s line of sound reduction materials this week at the 2012 POWER-GEN International Show being held in Orlando, FL on December 11-13, 2012. Generator noise is a growing problem everywhere, especially in residential neighborhoods, where multiple units can be running at once after a storm or power outage. This is the type of noise that contributes to noise pollution and the health risks that go along with it. People are becoming more proactive about creating a quiet environment, especially at home. Acoustiblok All Weather Sound Panels® are engineered specifically to withstand the most rigorous outdoor and industrial environments. Water, moisture, humid salt air or salt water, dirt, dust, constant ultraviolet light, chlorine air, grease, corrosion, and most harsh chemicals are not a problem for this wonderful product. 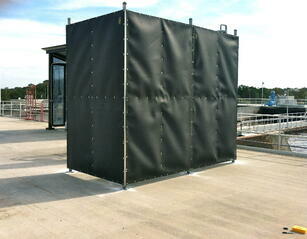 The hurricane All Weather Sound Panel is tested to withstand wind load more than 270 MPH. Acousitblok’s QuietFiber® is the answer to any space in need of a noise fix that is easy to install anywhere noise is a problem, without spending thousands of dollars to retrofit sound abatement material under drywall, or cover walls with expensive sound panels. Acoustiblok’s QuietFiber® is UL fire rated for floor, wall and ceiling applications, a significant safety factor when compared to common insulating materials – usually highly flammable -- often used in an attempt to reduce sound. Acoustiblok sound reduction material is made of a 1/8-inch (3 mm) thick proprietary viscoelastic polymer material with a high-density, non-barium mineral content, heavy yet extremely flexible. It is easily cut to fit with a utility knife, which makes it customizable to fit around pipes and other fixtures. Just one thin layer of Acoustiblok added to a standard metal or wood stud wall will result in more sound reduction - and provide more privacy - than 12-inches (30.5 cm) of poured concrete. Get more information on some of Acousitblok’s generator-related projects here. 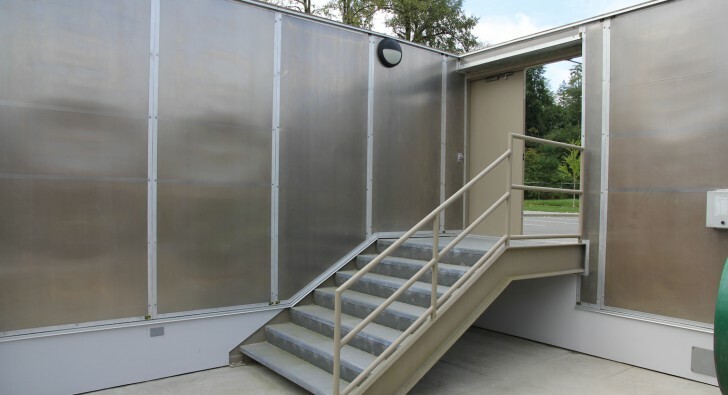 Acoustiblok, a NASA “Spin-off” company, developed the All Weather Sound Panels, engineered specifically to withstand the most rigorous outdoor and industrial environments. Water, moisture, humid salt air or salt water, dirt, dust, UV, chlorine air, corrosion, and most harsh chemicals do not affect them. The industrial sound panels are available with an acoustically transparent five micron stainless steel dust filter for outdoor use in the world’s toughest environments, from the mining industry to the desert areas of the Middle East, and other applications where dust is a concern. Acoustiblok sound panels are extremely durable and are currently in use by the United States Army in the Middle East. Washable, durable, long lasting and usable in hundreds of areas and applications, the Acoustiblok All Weather Sound Panels are not just "sound absorbing" but also "sound blocking." This allows the panel to not only absorb sound but also stop the sound from penetrating through the panel, a very meaningful advantage over conventional "sound absorbing" panels that stop sound reflections but are poor sound barriers. TAMPA, Florida, November 5, 2012, 2012 – Tampa-based Acoustiblok, Inc. has donated its noise reducing Acoustiblok Wallcover® material to the Bellewood Home for Children in Anchorage Kentucky, to block noise from the campus’s multi-machine laundry room from passing through a common wall and into the facility’s therapy room. Installation of the Acoustiblok Wallcover effectively reduced noise in the therapy room by 10 decibels, which translates to a perceived volume reduction of 50 percent. The donated Acoustiblok Wallcover was installed last week as part of a large-scale project to restore and improve the facility’s five residential cottages, recreational areas and common buildings, and to improve safety and enhance Bellewood Home’s village setting. For 163 years, Bellewood Home has provided a safe haven for thousands of abused, neglected and homeless children from across Kentucky. Lahnie Johnson, President and Founder of Acoustiblok, Inc., says he is proud that the company was able to contribute the noise blocking qualities of Acoustiblok Wallcover to the ambitious renovation project at Bellewood. “When you have noise from commercial machines such as those in the facility’s laundry room passing through a common wall into the therapy room, it can be detrimental to the children’s therapeutic or remedial treatments,” Johnson says. “Noise is known to cause a myriad of problems in therapeutic settings, including stress, inability to focus, and other problems. For more information on Acoustiblok Wallcover or any of Acoustiblok’s noise abatement products, visit the Acoustiblok website, Email sales@acoustiblok.com, or call 813-965-4373. Acoustiblok, Inc., a NASA spin-off company, has been providing high quality noise abatement products since 1998, earning the industry’s highest ratings from architects, builders, and consumers. Acoustiblok is a proprietary viscoelastic polymer material with a high density mineral content, heavy and yet extremely flexible. As sound waves cause the Acoustiblok material to flex, internal friction occurs and the acoustical energy is transformed into inaudible trace amounts of heat (adiabatic). Just one, 1/8-inch layer of Acoustiblok in a standard wall can result in more sound reduction than 12-inches of poured concrete. Environmentally friendly, Acoustiblok contains no lead, barium, or asbestos, is UV resistant and impervious to water and mold; it is UL rated and classified in the US and Canada (CUL) for virtually all wall, floor, and ceiling installations. VANCOUVER, BC, October 22, 2012 – Raicor Contracting, Ltd. earned the Northwest Wall & Ceiling Bureau’s Outstanding Project of the Year 2012 award for the visually spectacular LDS Temple located about 50 miles southeast of Vancouver in Langley, BC. Included in the project’s flawless design are Acoustiblok’s All Weather Sound Panels, custom fit to create a clean, architecturally attractive noise barrier for the Temple’s roofless ancillary building that houses an industrial generator and HVAC systems. Project Manager Timo Orava of Raicor worked with acoustic specialist Steve Hibbens, who recommended the All Weather Sound Panels for the project. Not only did the Temple officials want the noise reduced for Church members to worship in peace and quiet, the solution had to offer a clean, architecturally attractive appearance in keeping with the meticulously designed interior. The LDS Temple which was built in the spirit of Solomon’s Temple of the Old Testament, according to Orava. Extreme care was taken not only in the design, but in the execution, which took more than three years to complete. “The LDS Temple is an inspiring monument that Church leaders wanted built to perfection, right down to the very last detail,” Orava says. “It’s a visually stunning structure built to last, ideally, for hundreds of years. The project was challenging for Orava’s team at Raicor because of the extremely high building standards in place, and the Temple leaders’ meticulous requirements. With a zero-tolerance for deficiencies, from the drywall to the wall sconces, the project demanded faultless workmanship. Orava said the Acoustiblok All Weather Sound Panels were no exception, and needed to fit exacting specifications in the structure. Nineteen standard 4 foot x 8 foot panels and 13 custom sized panels were used to create the precision noise barrier that Temple leaders wanted; clean, aesthetically pleasing, and most important, effective. Acoustiblok President and Founder Lahnie Johnson says the All Weather Sound Panels are different from other conventional sound panels. In addition to being able to stand up to the most extreme environments, they not only absorb virtually all sound but they also contain a layer of Acoustiblok material which provides exceptional noise blockage. 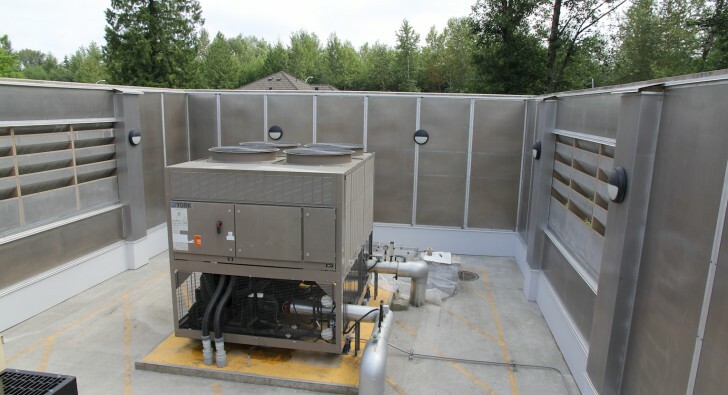 The sound absorbency of the panel brings down substantially the acoustical energy around the generator and chiller by eliminating all sound reflections in the area, while the Acoustiblok material in the panel allows it to also be an excellent sound barrier. These qualities make the All Weather Sound Panels a perfect fit for the LDS Temple, where they will perform at their full potential in the Northwest Canadian environment. “Vancouver experiences some real weather extremes, which these panels are built for,” Johnson says. For more information visit the Acoustiblok website (www.acoustiblok.com), Email (sales@acoustiblok.com), or call 813.980.1400. TAMPA, Florida, September 27, 2012 – Acoustiblok, Inc. Founder and President Lahnie Johnson this week approved a working agreement with Carlos Montas as Acoustiblok’s manufacturing representative in the Dominican Republic. Montas, Engineering Manager of Electicidad del Caribe SRL (EDELCA) in Santo Domingo, will represent Acoustiblok sound abatement products throughout the Dominican Republic. 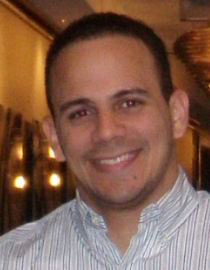 Montas, a native of the Dominican Republic, is a 2005 graduate of Instituto Tecnológico de Santo Domingo (INTEC). He has built a career in the design, installation, and supervision of emergency generator systems in the industrial and commercial communities throughout the Caribbean. 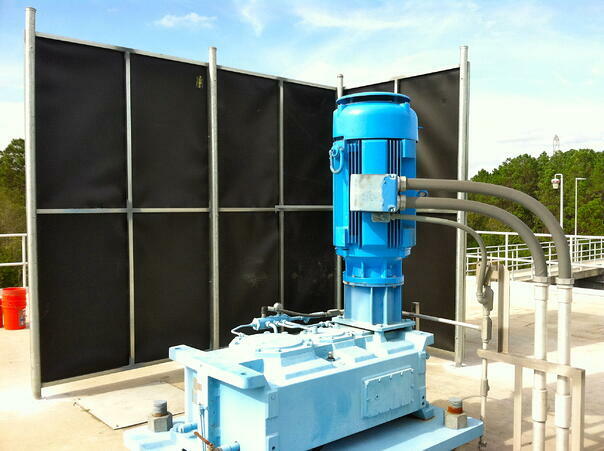 He was first introduced to Acoustiblok products after installing QuietFiber noise absorbing material in one of EDELCA’s massive generator system projects to dramatically lessen the impact of the high decibel generator noise outside the generator facility. With years of experience designing and installing his trademark generator systems, Montas understands the importance of installing noise absorbing material in every generator room and outbuilding he designs, since the noise can be intolerable and pose a real problem for businesses, residents, and visitors. EDELCA is a leader in the installation of emergency generation systems in the Dominican Republic and throughout the Caribbean, where tropical storms and weather events are a source of frequent power outages, making emergency generators a necessity for businesses to function smoothly. As an authorized dealer of QuietFiber and other Acoustiblok noise deadening products, Montas offers first-hand experience and a seasoned understanding of how to solve noise issues from a variety of sources, including one of the toughest – industrial generators. “Carlos Montas is a highly knowledgeable and sought after emergency systems engineer in a high-demand environment,” Johnson says. “I am convinced that we could have no better representative for Acoustiblok products in the Caribbean, given his extensive experience and comprehensive understanding of the region’s distinct noise abatement needs. For more information on Acoustiblok products, visit the Acoustiblok website, Email emontas@edelca.com.do , or call 809-596-8290. Just one, 1/8-inch layer of Acoustiblok in a standard wall can result in more sound reduction than 12-inches of poured concrete. Environmentally friendly, Acoustiblok contains no lead, barium, or asbestos, is UV resistant and impervious to water and mold; it is UL rated and classified in the US and Canada (CUL) for virtually all wall, floor, and ceiling installations. For more information, visit the Acoustiblok website, Email sales@acoustiblok.com, or call 813-980-1400. TAMPA, Florida, September 20, 2012 – Acoustiblok, Inc. 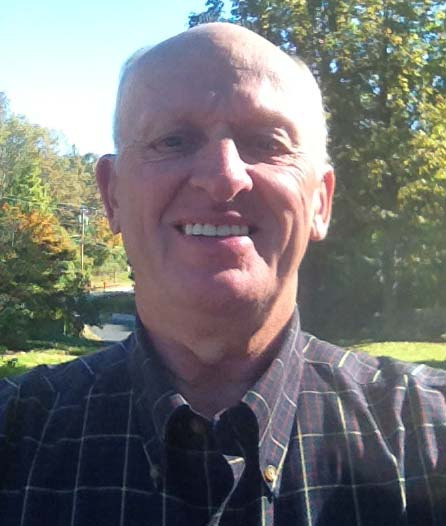 Founder and President Lahnie Johnson this week approved a working agreement with Alan Peterson as Acoustiblok’s manufacturing representative for Acoustiblok in New England. Peterson, owner of A.E. Peterson & Associates in Bedford, New Hampshire, will represent Acoustiblok sound abatement products in Maine, New Hampshire, Vermont, Massachusetts, Connecticut and Rhode Island. Peterson, a native of Boston, attended Northeastern University before establishing himself in commercial aluminum window & doors sales, specializing in acoustical, hurricane, and historical windows. He founded A.E. Peterson & Associates in 1982, working with architects in New England, California, Texas, Florida and Georgia on finding solutions to noise problems in and around airports, trains, highways and other industrial settings where noise levels can reach 110 decibels. Peterson’s company also focuses on treating buildings in coastal areas where hurricane conditions exist, as well as some of the country’s oldest industrial buildings, with highly specialized historical aluminum windows. Acoustiblok is a natural extension of Peterson’s product offerings, designed to fight noise pollution in some of the most extreme settings. Acoustiblok provides sound abatement materials for indoor and outdoor use to address noise issues in industrial, commercial and residential applications. “Alan Peterson is a respected and sought after acoustical door and window expert in a highly specialized niche,” Johnson says. “His expertise and his work with architects in New England and nationwide fits perfectly with Acoustiblok’s ongoing expansion throughout the U.S.
For more information on Acoustiblok products, visit the Acoustiblok website, Email Alan Peterson, or call Alan Peterson at 603-472-8454. Just one, 1/8-inch layer of Acoustiblok in a standard wall can result in more sound reduction than 12-inches of poured concrete. Environmentally friendly, Acoustiblok contains no lead, barium, or asbestos, is UV resistant and impervious to water and mold; it is UL rated and classified in the US and Canada (CUL) for virtually all wall, floor, and ceiling installations. 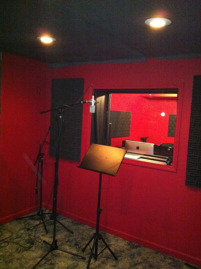 For more information, visit www.acoustiblok.com, Email sales@acoustiblok.com, or call 813-980-1400. 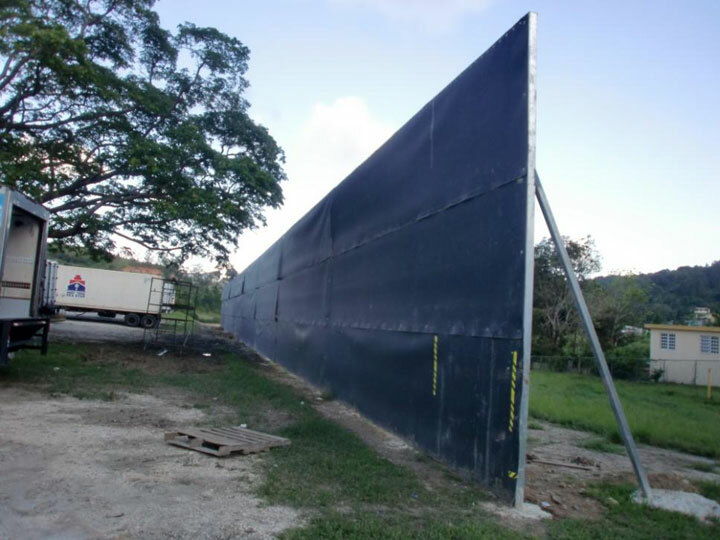 AIBONITO, Puerto Rico, May 23, 2012 – Installation of an 18-foot noise barrier utilizing Acoustifence sound blocking material has resolved a noise problem caused by truck traffic to and from the To-Ricos, Ltd. chicken processing and distribution facility in Albonito, Puerto Rico. A common problem at industrial plants across the U.S. and Puerto Rico, trucks at the To-Ricos facility arrive day and night to be loaded and unloaded, and are often left idling for hours. The loud noise created by the trucks bled into the neighboring residential community, and unable to escape it whether they were indoors or outdoors, neighbors began to complain. Exposure to continuous industrial noise can cause sleeplessness, elevated blood pressure, depression and other health problems. To-Ricos officials took action by contacting Tampa, Florida-based Acoustiblok, Inc., a manufacturer of residential and industrial noise abatement solutions. Acoustiblok consultants recommended the 18-foot Acoustifence barrier to block the truck noise from escaping into the neighboring community without interfering with the trucks’ ability to perform their functions and keep the plant operational. Acoustifence is a thin outdoor noise blocking material which acoustically performs precisely as lead does, but without the environmental hazard of lead. It is now widely used in industrial environments, highways, construction sites, mass transit rail lines and in many other outdoor applications where noise is a problem. Plant personnel constructed an 18 foot metal frame to support the Acoustifence sections, which was easily attached thanks to anodized brass eyelets installed along the top and bottom edge of each section, using heavy duty nylon ties included with the product. “Acoustifence is becoming more popular for industrial applications like this one, where truck and traffic noise is bleeding into the surrounding communities and literally disrupting people’s lives,” said Lahnie Johnson, founder and president of Acoustiblok, Inc.
To-Ricos is a division of the Pilgrim’s Corporation, the world’s second largest chicken producer headquartered in Greeley, Colorado. Acoustiblok, Inc., a NASA spin-off company, has been providing high quality noise abatement products since 1998, earning the industry’s highest ratings from architects, builders, consumers, and even the British House of Commons. Acoustifence is a 1/8-inch (3mm) thick unique sound deadening material measuring 6 feet (1.82 meters) high by 30-feet (9.14 meters) long with black anodized brass eyelets along the top and bottom edge for easy attachment to any existing fence or structure. Heavy-duty nylon ties are included with each roll. Easily installed or removed in less than one hour, impervious to mold, mildew, and UV, Acoustifence is virtually indestructible. The soundproofing material in Acoustifence is a proprietary formula of the Acoustiblok Corporation, developed and refined over a 10-year period. Acoustifence has proven performance and is easily suspended from a chain link fence, eliminating the need for expensive permitting or structural requirements. Any height can be obtained by simply overlapping the sections. To store, Acoustifence sections simply roll up like carpet into less than a 12-inch diameter. Independent lab tests of the U.S.-made Acoustifence material show a sound transmission classification (STC) of 28, which represents to the human ear an approximately 85-percent sound reduction. However, results will be less, relative to surrounding sound reflective objects such as buildings or trees and the amount of Acoustifence installed. Acoustiblok, Inc. also has available high quality landscape attachments which fit directly over the Acoustifence to provide a realistic landscape appearance. A variety of landscape attachments are available to choose from, including floral gardens, green meadows, English garden walls, and other scenic illustrations to blend into any natural backdrop or enhance an unfinished yard or property. 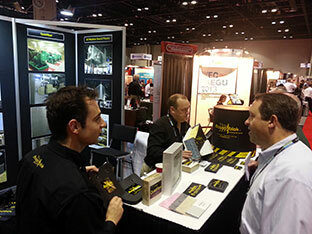 For more information on Acoustifence, visit the Acoustiblok website, call 813-980-1400, or E-mail sales@acoustiblok.com. Industrial noise pollution from back-up generators is a growing problem in the Dominican Republic and throughout the world. One generator designer installed QuietFiber noise absorbing material to lower the decibel levels at the newly constructed Galleria 360 mall in Santo Domingo. SANTO DOMINGO, Dominican Republic, May 15, 2012 – Installation of 18,000 square feet of non-fiberlass QuietFiber® noise absorbing material has been completed in the massive generator room of the newly constructed, 750,000 square foot Galleria 360 mall in Santo Domingo. QuietFiber, a product of Acoustiblok, Inc. in Tampa, Florida, was installed on the ceiling and walls of the mall’s generator and substation rooms. These rooms house the industrial emergency generators necessary to keep power running in this coastal area of the Caribbean, plagued by frequent power outages. The Galleria 360’s industrial generators, installed by Santo Domingo-based Troncoso & Asociados, are a staple in this island republic. Edelca owner Carlos Montas, the Dominican Republic representative for Acoustiblok, Inc., consulted with Jay Boland of Acoustiblok, Inc. and recommended QuietFiber on the project after achieving excellent results with QuietFiber on a similar project at the La Sirena Superstore in the eastern coastal town of Higuey, Dominican Republic. “Even though QuietFiber is not the least expensive product on the market, I keep coming back to it because the results beat all the competitors’ noise deadening products with double the noise insulating qualities,” Montas said. “The customer on this job wanted to install a double layer of a different product but I convinced him to try the QuietFiber. Montas says noise from these industrial generators on which the island has become dependent in order to maintain consistent power is a major problem plaguing businesses and residential property owners when the generators are running. Not only is generator noise bad for business, but its constant drone can cause permanent hearing loss. Another important consideration in the selection of soundproofing material is its fire resistance. Recently in Santo Domingo a serious fire started in a generator room, and the existing foam sound proofing material was a prime contributor. The fire caused Montas to search for a new fireproof solution. QuietFiber is fire resistant even at 2,000 degrees. Montas and his crew were able to easily cut the QuietFiber to fit around electric conduits, and secured the material to the walls and ceiling with standard insulation stick pins. The sound deadening qualities of QuietFiber will help to protect the mall’s employees, and streams of tourists and local residents from the high volume industrial noise caused by the generators when they are operating. 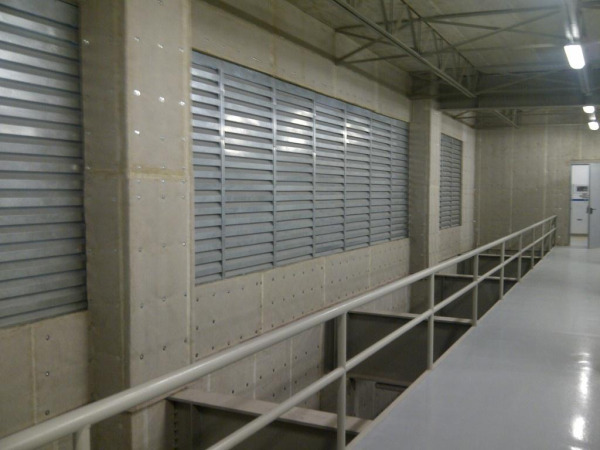 Lahnie Johnson, president and founder of Acoustiblok, Inc., says that the application of QuietFiber in the Galleria 360 generator and substation rooms was exactly what was needed for addressing the high decibel, reverberant sound emanating from the concrete walls. High sound absorbency QuietFiber is a two-inch thick interior/exterior noise solution that can also be cut to fit and simply hot glued underneath a bar, cabinets, countertops, tables, chairs, behind a wall tapestry or curtains. Slide a QuietFiber “pillow” on top of cabinets, or anywhere else that reverberant noise and echo is a problem. Easily cut to size with a serrated knife, QuietFiber can be concealed almost anywhere. 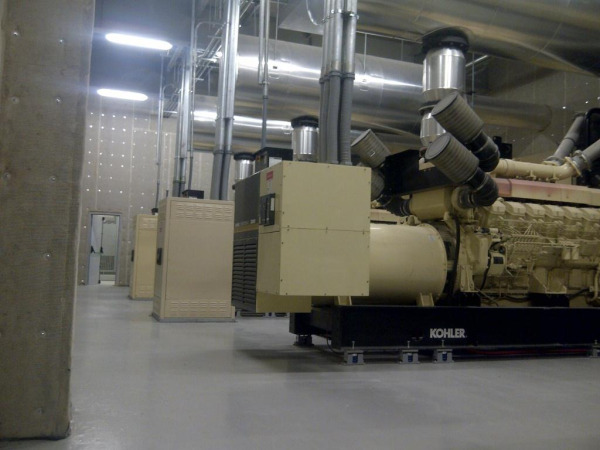 QuietFiber® is used extensively for industrial noise reduction in large diesel generator rooms. It is also the answer to any space in need of a quick noise fix. QuietFiber is easy to install anywhere noise is a problem, without spending thousands of dollars to retrofit sound abatement material under drywall, or cover walls with expensive sound panels. QuietFiber is UL fire rated for floor, wall and ceiling applications, 100 percent recyclable and 100-percent made in the USA. 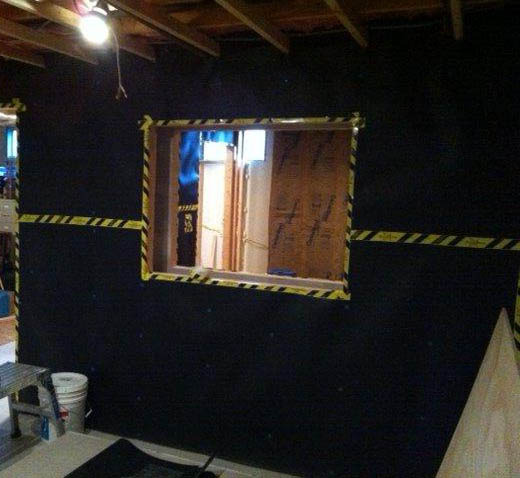 MEDFORD, New York, May 2, 2012 – Acoustiblok noise abatement material was installed in the nearly completed Artist Workshop Studios recording facility, an in-the-box (ITB) studio designed and built by Artist Workshop Studios owner Tom Donofrio. Acoustiblok was chosen to provide a sound barrier for the small, 12 foot x 12 foot basement studio that could drop decibels levels within the space and provide a neutral acoustical environment for recording. For more information, visit the Acoustiblok website or email sales@acoustiblok.com.